Walmart money transfers: Walmart-2-Walmart will offer store-to-store transactions for cheap fees. Walmart is jumping into financial services. First organic foods, now financial services. Walmart has announced that it will roll out an in-store money transfer service for customers beginning April 24. The news came just over a week after the retailer said it was jumping into the organic foods market and would carry Wild Oats organic food items at a fraction of competitors’ costs. The new financial product, Walmart-2-Walmart Money Transfer Service, is a partnership with financial services firm Ria that will allow customers to transfer funds between more than 4,000 Walmart stores in the U.S. As with most Walmart products, the company says its prices will undercut those offered by competing services. “Walmart-2-Walmart brings new competition and transparent, everyday low prices to a market that has become complicated and costly for our customers,” Daniel Eckert, senior vice president of services for Walmart U.S., said in a statement. Here’s how it will work. To make a transfer, customers will walk into a store, go to the designated “money center” or customer service desk, and fill out a form with the transfer amount, recipient’s name, and state the funds are heading to. Cash and debit cards will both be accepted for payment. 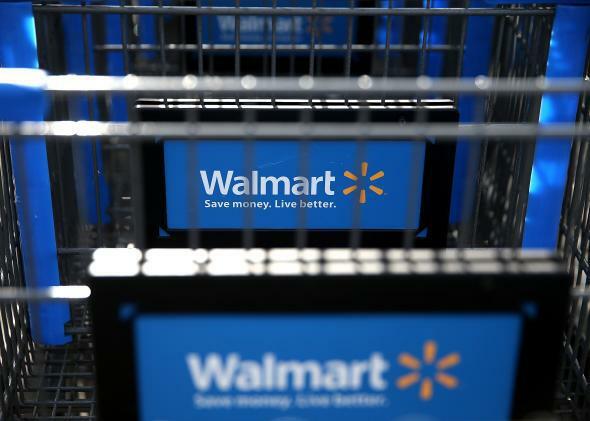 Walmart-2-Walmart will then transfer the money and the person on the other end can pick the cash up at any store in the specified state within a few minutes, Walmart spokeswoman Sarah McKinney said. Customers using Walmart-2-Walmart will pay $4.50 to transfer up to $50, and a flat rate of $9.50 to transfer between $50 and the maximum of $900. Walmart says that competitors charge $4.75 to $5 for transfers below $50, and anywhere from $11 to $76 for larger sums. Financial services make up a relatively small portion of Walmart’s business—just 1 percent of U.S. sales in 2013, according to Reuters. But with Walmart-2-Walmart, the company is hoping to tap into the 28 percent of Americans who classify as either unbanked (they don’t have their own bank accounts) or underbanked (they have poor access to the financial services normally offered by banks). For these people, money transfers often make up a large and important part of basic household bookkeeping. Walmart will continue to offer other financial services and money transfer options, such as MoneyGram, which facilitates international and online transfers. Walmart-2-Walmart will stick strictly to domestic, in-store transfers, but analysts say the service could still prove a formidable threat to companies like MoneyGram that rely on the business they get from Walmart locations. “The bigger loser is MoneyGram,” Rahul Agarwal of Guggenheim Partners told Reuters. “MoneyGram gets a quarter of their revenue through that agreement.” Shares of MoneyGram International fell 3.2 percent Thursday on the news, while Western Union, another provider of money transfers, saw its stock drop 5 percent. Walmart expects its new service and competitive fees to be a traffic driver for stores across the U.S. It would also seem that hosting the transactions on-site might keep some of that money in-house for good, if customers turn around and spend the funds on Walmart products.